A Cute Duckie circular 18'' foil balloon (45.7cm). This balloon has pastel stripes of pink, yellow and blue colours, with an adorable yellow duck with some presents and the words Baby Shower on the balloon. 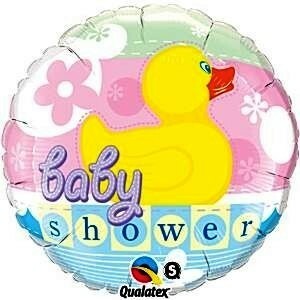 A Cute Duckie circular 18'' foil balloon (45.7cm). This balloon has pastel stripes of pink, yellow and blue colours, with an adorable yellow duck with some presents and the words Baby Shower on the balloon. This balloon is suitable for helium filling and is self sealing.